I’ve gotten a lot of questions about it from Facebook friends who are music educators, so I thought it might be worth discussing here. 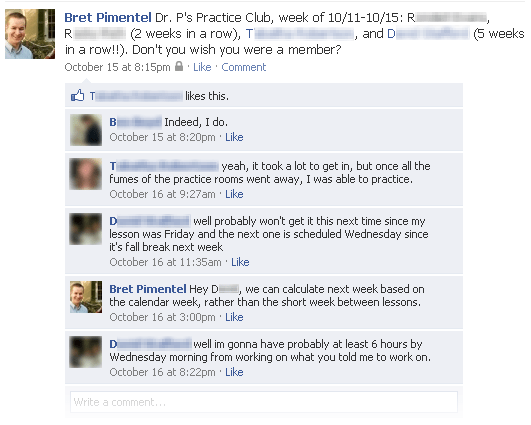 When my students come in for their lessons, I ask them to self-report their practice hours for the week. My students are good kids (born and raised in the Bible Belt), and I generally just trust them to report honestly. I also have them keep practice journals, which would at least slightly complicate fibbing about their hours. If they meet their minimum weekly requirement (it varies: more for performance majors, less for music education majors, etc.) they are automatically inducted into “Dr. P’s Practice Club” for the week. At the end of the week I post their names on Facebook and on my office door, plus usually a running tally for those who have made it for several weeks in a row. There are, at this point, absolutely no benefits or privileges to “club” membership other than a little recognition (and, of course, a week’s worth of improvement). I also use Facebook to give public kudos to students for their recitals, ensemble performances, and competition participation and awards. Most of my students have become my Facebook friends, so I can “tag” them when I post. This means that they get alerted that they have been mentioned in my post, and certain of their Facebook friends and mine will also be able to see it. For some of the students, this may include classmates, other music or non-music faculty, friends studying music at other schools, authority figures from work or church, and even parents. Having four (out of about a dozen) make the “Practice Club” in one week is pretty good for me, since the practice requirement is reasonably high and instilling a good practicing ethic is a project in process. Of the four students who made it in this particular week, two are new to my studio this year, and, in general, the newer students seem to be doing better at getting their hours in. I wasn’t as strict about practice hours last year, so some of the returning students may not be taking the Practice Club as seriously. The student who is concerned that he may not get all his hours in because of a week shortened due to a school holiday is one of the new ones. The question I’m getting from fellow educators, of course, is: Is it working? The answer, of course, is: Maybe. I think some of my students crave the public-ish attention, whether from me or from others who might notice what they are accomplishing. And doing this requires almost no effort on my part—if I can encourage students to practice by taking two minutes a week to put their names into my Facebook status, then it’s well worthwhile. Naturally, there are others among my students who resist any effort I make to get them into the practice rooms, and a Facebook mention isn’t going to change their attitudes. And I still believe that the students who will have the greatest success are the ones who self-motivate. All in all, I think this has been a good tool for developing a sense among my students that the ones who consistently meet expectations are part of a select group, and certainly when I have special opportunities or honors that I can give to students, I probably won’t need to look farther than my Practice Club. I would be interested to know what ways you are using social media, etc. in your teaching, and what you’re doing to get your students practicing (especially if consistent, sustained practice is a new concept for them). Leave me a comment below!